Size: 8-1/2 x 10-1/2 x 27 inches high, just low enough to make me sit and not lean on it. Materials: A chunk of leftover maple from making my tail vise, a scrap of walnut that I found at the local lumber yard that was going to be a spoon, and three maple dowels for the legs & cross pieces. The biggest challenge was the support pieces for the legs. I wanted a kind of funky looking art deco kind of stool. 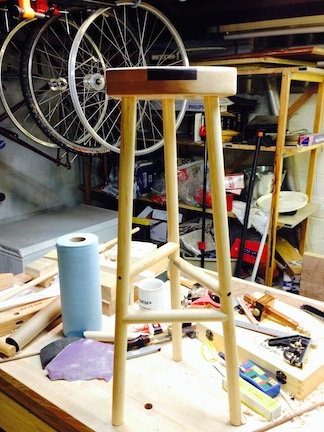 I used to make bike frames, and thought mitering the deal that keeps the legs from spreading would be a neat idea. And then a dowel through it would be neat Turns out that’s easier to do with metal. The fitup is okay, but a drill press is not a mill and a metal file doesn’t do much to wood. In the end I figured it out / got an okay fit, but it for sure exposes weaknesses in both planning and execution. The dowel bit was way harder than I thought it would be, we’ll see if it falls apart. It was a lot of fun, I started with a laminated board and ended with a coat of shellac on it in one day. Thanks for putting this together. I picked up the idea of woodworking on a whim at the end of November last year and have 1/2 built a lot of things, but this is the first thing I’ve finished from that wasn’t a work bench or saw bench. Thanks so much for putting it together, was nice to have a project to go after that was manageable and fun! Chris you are a great motivator for sure, a contest (but low key, it is a shop stool after all) lots of interested woodworkers building, even more interested woodworkers watching, prizes and supporting companies tools and learning opportunities for prizes (great idea). You bring excitement to woodworking, and considering this is a solitary endever for so many of us, your ability to bring lots of woodworkers together “online” is awesome.